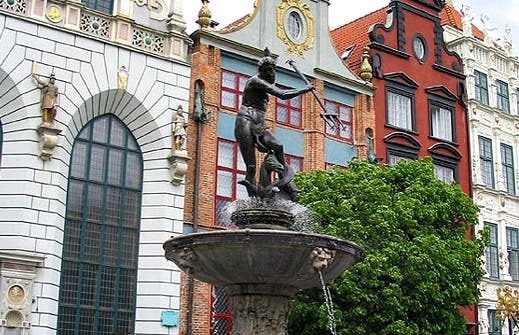 The Neptune Fountain from 1633 is one of the symbols of the city of Gdańsk. It represents the relationship of the city with the sea. The entire fountain was designed by Abraham van den Blocke. The magnificent gate around it was forged in 1634. One of the legends of the city says that Neptune contributed to the invention of Goldwasser, the famous liquor of Gdańsk. They say that he became angry to see people throwing coins in the fountain so he struck his trident into the water, turning the money into tiny pieces of gold that now decorate the herbal liqueur with glitter.